by Andy Higgs in Europe, Places, Retro Travel Photo, Switzerland. They say that Norwegians are born on skis, but hey, some Englishmen aren’t so far behind! While my family was living in Belgium we were lucky enough to be able to stay in a chalet in Switzerland owned by some friends. 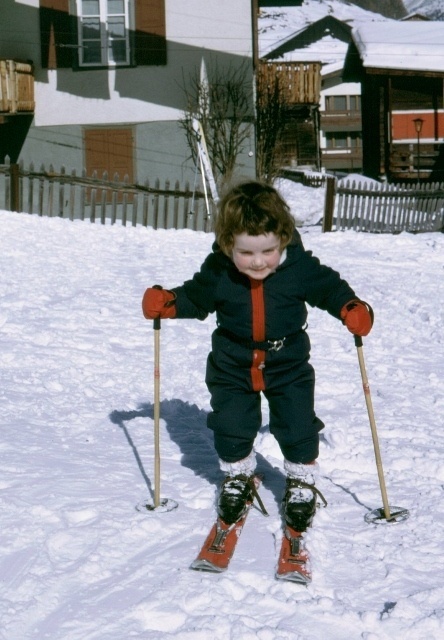 I guess this is where my life-long love of skiing began, and perhaps it was only logical that I’d end up living in a snowy country like Norway. Having said that, I was only able to practice a week or two each year which is my excuse for my only average ability at the downhill variant… Saas Fee developed beyond recognition and is now a major resort in the Alps and somewhere I really should get back to one day. It took many, many years before I made the transition to real skiing, i.e. cross-country, the praises of which I sing here. Anyone want to guess my age and the year this was taken?